In the past two years, many changes have swept through the California cannabis market–new laws, shops, brands. Though I’m thankful the industry is expanding and giving us more options than ever, I sometimes find myself lost like that first day of school; it’s exciting but can feel overwhelming. Some days I’m in the mood to experiment with something new, but other days I just want some high-quality flower to twist up. A welcomed constant in the ever-changing tides of the cannabis industry sea, Flav (formerly FlavRX) is a reliable brand producing flower, vape cartridges, edibles, tinctures, live resin concentrates and capsules. Does their Asian OG 3.5g indica strain provide those heavier, calming effects, or is it just a mediocre strain? Discover that and much more in this thorough appraisal. Flav’s flower packaging isn’t that impressive, but gets the job done–not unlike wearing an Old Navy shirt. The eighth comes in a glass jar with a black, child-proof, twist-off top and tamper-proof sticker seal. There’s no box or plastic bag for protection like most prepackaged flower and, unlike Flow Kana’s flower, the glass has no UV protection so it’s more prone to light and heat exposure. However, the label and testing sticker wrap the jar, protecting it from sunlight. Flav includes a Boveda two-way humidity pack to help keep the cannabis fresh, a nice touch that not all brands add. Since I plan to roll this Asian OG into joints, I don’t want a dry, crumbly texture. Like the packaging, the labeling leaves a bit to be desired. The stickers outside of the jar have the basic adult-use info like the brand name, strain name, weight, warnings, verifiable testing results (24.9% THC and 0.1% CBD), and manufacturing and best by dates. The label itself has a bland black, white and gray color scheme; nothing eye-catching. When it comes to flower, I really don’t care about the package’s style as long as the jar is sturdy and the strain is top-shelf. However, I do care about the details. I’d like to see some info on the brand, growing practices and strain lineage, which could fit on an exterior box or plastic bag. A terpene profile and other detected cannabinoids would have also been nice. After a quick online search, I actually found some of that information on their Twitter. This flower is grown indoors in Orange County, California, blooms for 60 days, and contains the terpenes geraniol (.2%), ocimene (.3%) and myrcene (.2%). This Asian OG 1/8th doesn’t have the same aroma I’m used to in other OG strains. After opening the jar, I was immediately hit with a peppery smell, which doesn’t really tickle my fancy. But as I started breaking and grinding the buds, the flower released a different yet familiar fragrance: that wonderfully “kushy” smell reminiscent of Master Kush and Bubba Kush (both of which I’d like to see as Jedi Knights). It’s rich, almost nutty, like a semi-sweet coffee bean, along with subtle piney and lemony notes. The buds had a great density and texture and were larger than average (the biggest was nearly two grams). They were frosty, pulled apart easily and left a slightly sticky residue on my fingertips, a great sign that this premium flower will fit easily in a cone. The first puff induces a few coughs and a slight throat tickle, but overall, my hit was smooth. While the flavor isn’t as bright as the aroma would suggest, it isn’t unappealing. What entices me the most about Flav flower is its consistently pleasing effects. 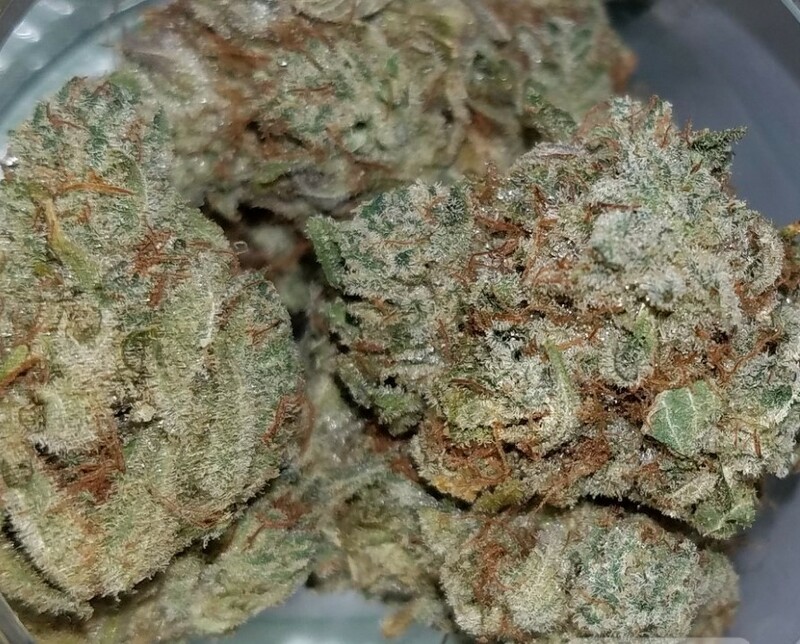 Asian OG has a relatively strong onset, probably due to the high THC content, as I felt a body high almost immediately, starting with my head and facial muscles. After smoking a full joint, the flower calmed my spastic stomach, eased my shoulder tension and made my eyes heavy for a few hours. I recommend using this strain after a long week while binge-watching a new Netflix series, or for a post-workout recovery and muscle relaxation. Don’t plan any social outings with this stuff. 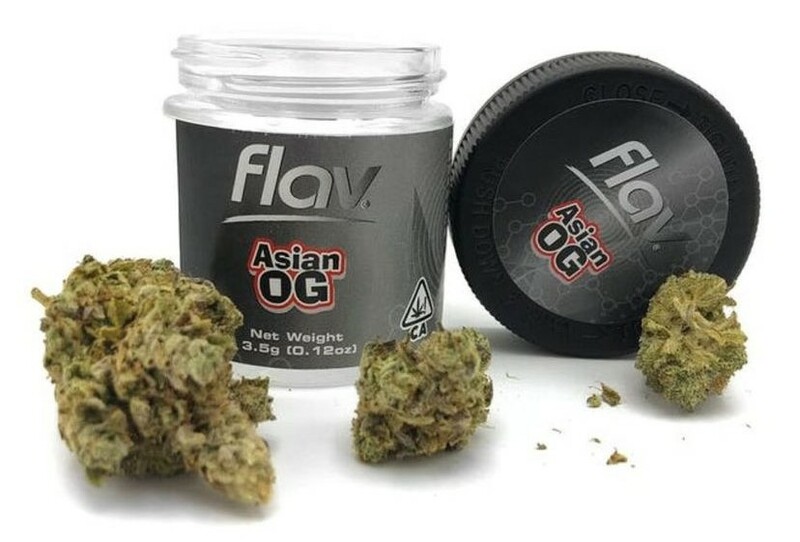 An eighth/3.5 grams of Flav’s Asian OG will set you back $55. That number feels a bit steep for the lack of packaging, even for a quality OG. I’d buy this again, but only if I needed its strong sedative effects. Packaged in a simple glass jar with a child-resistant lid and a two-way humidity pack to maintain a proper moisture content. Nothing appealing or eye-catching about the graphics used. Lab test label was placed really awkwardly (down the side and wrapped around the bottom. I would like to have seen more thought put into this packaging. Sufficient labeling for adult-use compliance, but not much else. 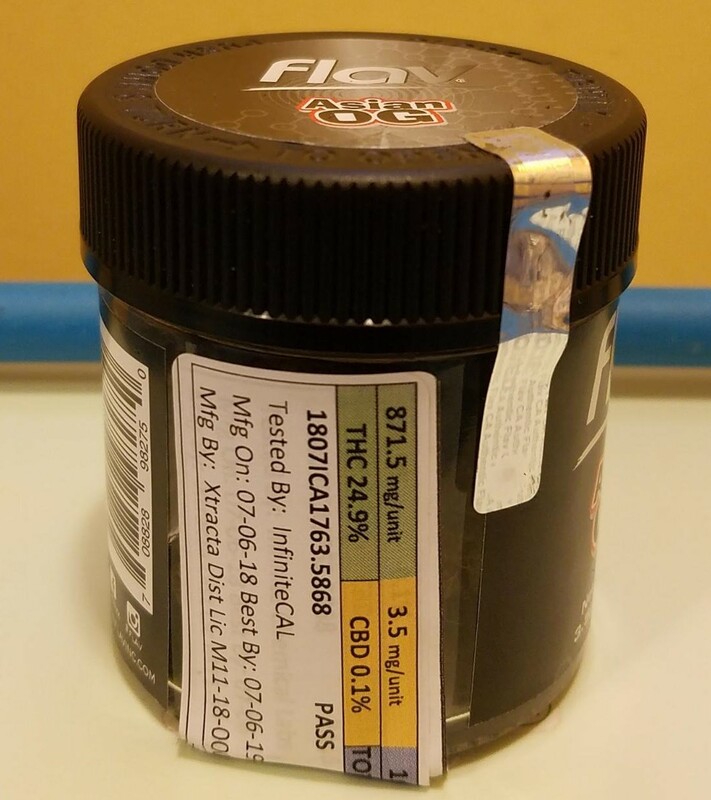 Jar includes net weight, strain name, brand name and web/social media addresses, and government warnings. Includes lab-test label with QR code to verify results and a breakdown of THC (24.9%) and CBD (0.1%). A profile of the major terpenes and other detected cannabinoids would have also been nice to see, plus any information about the growing practices and strain lineage. Hits you with a peppery smell as soon as you open the jar (not my favorite experience). Released the wonderful “kushy” fragrance as I started breaking and grinding up the flower. Rich, almost nutty aroma almost like a sweet coffee bean. Complemented with the subtle OG smell characterized by lemon and pine. Flavor isn’t so bad that you don’t want to smoke this flower. I expected a much more enjoyable flavor after smelling the ground buds, but no dice. Buds were on the large size for an eighth (the largest was almost 2 grams!). Two-way humidity pack enabled the flower to hold an ideal moisture level and maintained a fresh feeling. Well-formed buds that pulled apart easily, leaving a nice sticky residue on my fingers. This made for a little scratchiness in the back of the throat and inspired a few coughs. On the smooth side overall. White and soft all the way through. Flower produces relaxing, pain easing effects that I’m after when choosing a strain. Calmed my spasming stomach and began to relieve my shoulder tension. Slightly sedative, not a great daytime strain if you want to be productive. Flav makes sure to maintain optimal conditions for their different specific genetics. We can trust this Asian OG will always be grown in the same conditions that are ideal for this strain. For flower that didn’t smell wonderful on the first whiff and lacked in taste, $55 is steep. I enjoyed the effects and the flower seemed well-grown, but it’s hard to rationalize spending that much on cannabis that I didn’t completely love. While the charcoal labeling and basic info aren’t very memorable, the thick, sticky flower is. Flav’s Asian OG tastes earthy, rich and lemony with a hint of pine that doesn’t hurt the throat too much and burns white and soft throughout. Its mellow indica high packs a nice punch so try it for serious pain relief, unwinding after work or just lounging. Still, I wouldn’t buy it if I wanted something more flavorful or energizing, especially with the steeper cost. After enough of this, you’ll feel less like the Energizer Bunny and more like the Chillout Chinchilla.